These comfortable loafers are made with a round toe, stitch details and faux zipper on side. Also made with an elastic side gusset, elevated heel and easy to slip on design. MEASUREMENT (tested sz 6; approx. ): Heel: 1", flat - True to size, brand new with original or Alrisco shoe box. 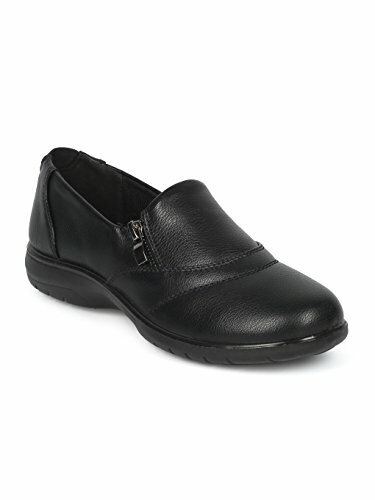 WHY YOU NEED THESE: Talk about the perfect work shoes for any work outfit! Whether you're going to the office or taking a stroll around the building, these work loafer will up your style game! COMFORTABLE AND SECURE FIT: With the perfect amount of padding, you'll be able to run around all day with ease in comfort! The laces give you an adjustable fit based on how fitted you'd like your shoes to be. QUALITY AND VALUE: Why spend more on high-end seasonal styles when you get the same quality at a fraction of the price? This style for just about any outfit and the slight incline in the heels help elongate your legs! The skid prevention rubber outsole will make sure you run around town safely. WORRIED ABOUT OUR ENVIRONMENT? : We love animals as much as you do! No animals were hurt during the production of these shoes. They are made with 100% vegan material and the rubber sole is from all man-made materials. Our manufacturers are very environmentally conscious! If you have any questions about this product by Alrisco, contact us by completing and submitting the form below. If you are looking for a specif part number, please include it with your message.